Profession: Copyright and Plagiarism Consultant at CopyByte. Duties include content tracking, content enforcement, expert witness testimony and public speaking. As you’ll read below, I’m not someone who ever sought to become a plagiarism expert. My original goals in life were to be writer and a journalist but, thanks to one of life’s curve balls, the past 16+ years of my life have been dedicated to plagiarism in one way or another. At first it was about protecting my own work, then about helping others and then about informing the world. Along the way, plagiarism went from being my passion and my intellectual curiosity to being my profession. For the past eight years I’ve worked full time as a copyright and plagiarism consultant. To that end, it’s been a deeply enriching career. 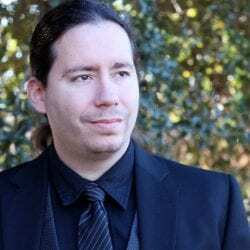 I’ve gotten the opportunity to speak at conferences all over the world, including four of the International Plagiarism Conferences, three SXSWi Conferences and much, much more. I’ve also been featured in countless publications including The Boston Globe, The Guardian, PBS MediaShift, The New York Times and the BBC to name a few. So while I never sought this career, I’m truly grateful for it, the opportunities its granted me and, most importantly, the people I’ve had the privilege to meet and work with. As I said above, I never wanted to be a plagiarism fighter, much less a plagiarism expert. That role was forced upon me in 2001 when I discovered that nearly six years worth of my poetry and literature was being plagiarized by an individual using the name “Crimson”. That incident, and the subsequent battle, left me both enraged and enlightened. I began to actively search for plagiarists of my work and was stunned to learn that my work, which is inherently personal and deeply emotional in nature, was being lifted at an alarming rate, so much so that hardly a poem, out of over a hundred, was left untouched. I briefly debated, as many do, shutting down my site and packing up my notebooks in favor of other means of publication. However, as I poured over the appreciative email I had received over the years, I knew that I couldn’t let the plagiarists win. Too many people enjoyed my work to simply back down. Still, something had to be done so I decided, perhaps against my better judgment, to fight back. As a journalism student, I had spent many long nights studying mass media law, including copyright. With that in mind, I had a head start on my plagiarists. I knew my rights and was ready to protect them. However, I was admittedly lost on the how. My first battle left me tired and frustrated, my second and third battles didn’t fare any better. Though I was succeeding in getting my work removed, I felt as if I was slowly losing my sanity in the process. The combination of drama, wasted energy and lost time was taking its toll. I began to do some research. Though only a few brief guides existed on the subject at that time, I was able to pull some useful advice from them and then combine that knowledge with my own research. Soon I was l branching out my research beyond just legal maneuvering and into technological solutions to handle the the more practical elements. I was soon researching databases to organize the endless stream of plagiarists, templates to speed up sending letters and screen capturing programs to preserve evidence. Within three years I had shut down well over 300 plagiarists and turned my methodology from an impulsive lashing to a science. 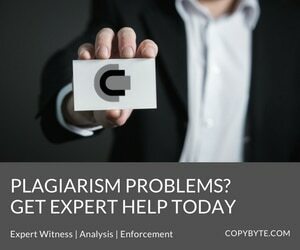 My method, a unique blend of legal maneuvering, technology and gumshoe work could handle most cases of plagiarism with only fifteen minutes of labor. This included preserving evidence, gathering all appropriate information, deciding a course of action and then contacting the appropriate party. There was no magic to it, just a matter of trial and error while combining my unusual skill set to come up with a unified solution. Yet, somehow, the results were undeniable. Though not perfect, my success rate was well over 95% and, best of all, my fight against plagiarists, though ongoing, was not distracting from my creating new material. I was able to battle an army of plagiarists with one hand firmly planted on my pen. However, I didn’t get to rest on my laurels long. The atmosphere on the Web was constantly shifting and my techniques had to be constantly refined. What worked well one month might create problems the next. Needing some means of keeping up, I sought out a blog or a news site on the subject. However, after a series of very intense searches, I failed to find one. However, I did find a great deal of evidence that others were being victimized by plagiarism as well. It seemed that the plagiarism problem ran even deeper than I thought and it became evident that the need for such a site went well beyond my personal desire to stay on top of things. Never having been one to sit idly by, I decided to step up and create such a site. Thus, Plagiarism Today was born. It’s been more than a decade since I made the decision to start up PT. In that time I’ve handled over a thousand more plagiarism cases and have advanced even further in my understanding of the subject. But what caught me the most off guard was how much I learned from others. Though I fully expected to help guide others through the process of fighting plagiarism, I’ve been amazed at how much many of them have expanded my knowledge on the subject, providing new viewpoints and ideas that I had never before considered. In that regard, PT remains very much a learning experience for me. Though I am always glad to teach and offer advice, I am even happier to learn.